School days will be divided equally into 3 semesters (approximately 7 classes). At the end of a semester, exam will be given to the students; Exam includes Written and/or Oral test. Home Work: 30 points total (10 points/semester). Exam: 70 points in total. 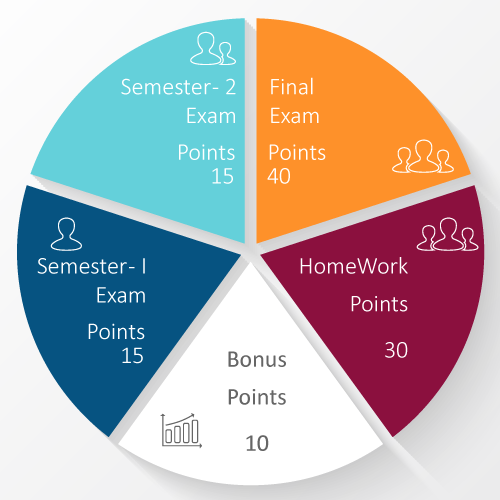 15 points for Semester-1 Exam (will be conducted tentatively on the 7th school day). 15 points for Semester-2 Exam (will be conducted tentatively on the 14th school day). 40 points for Final Cumulative exam ( Final school day). Bonus : 10 points for attendance (0.5 for each class up to 20 classes). 70% attendance is required to promote to the next level/Nilai. A minimum attendance of 70% (approximately 17 out of 22 classes) is mandatory for promotion. Students with 100% attendance will be recognized on our annual Awards Day. Parents should notify the school in advance if their child will be absent for the class. Please send email to both Tamil School email - tamilkalvi@gmail.com AND to the respective class teachers. Homework submission earns point towards the final score. So make sure homework is completed and submitted on time. Late submission will not earn full points. Students can submit their homework through others even if they are absent to the class. Students are expected to be in the class, at least 5 minutes before class start time.